The study by Ntegeka and Willems ten years ago is interesting in that the authors examine 108 years of rainfall records for a site in Belgium (recorded every 10 minutes!). They found large variability through time, with significant deviations which persisted for periods of 10 to 15 years. So a study done 10 years ago using a single site says what, exactly, about this observation aggregating 100s of sites? It probably doesn’t change the results that much, but wouldn’t be better to weight each gridpoint by cos(lat) to account for varying areal representation? to allow quasi-equal area grid spacing over the study region. 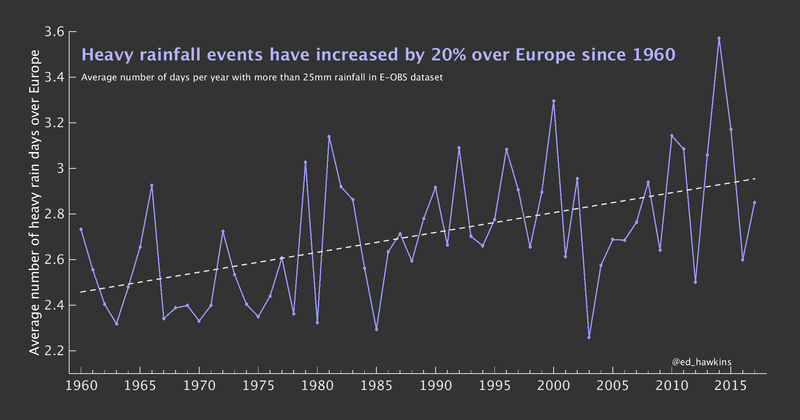 It adds a much longer time perspective, showing multi-decade swings in extreme precipitation events. What was the data before 1961? We do have weather data in the UK before that. The heavy rain change in 50 years doesn’t really seem very significant. Are there more plots that show thresholds other than 25 mm? I’m interested to see how it compares to changes in 10 mm – days and points in between. Perhaps you could show a surface plot?